AKA Climbing Mt Kaukau (That Which Gifts Us With The Idiot Box). Back in March, I made my way one sunny afternoon along part of Wellington’s Northern Walkway, before abandoning climbing to the tv transmitter at the top of Mt Kaukau in favour of ice-cream and Buffy the Vampire Slayer. Who wouldn’t do the same, I ask you? Today, on the one sunny day we’ve had after what feels like a month of endless bloody rain, I did the rest. Who knows when the opportunity will arise again… it’ll probably start raining again tomorrow. I started where I left off walking from Porirua to Johnsonville, at the end of Old Coach Road. From there it was an easy walk up along the hilltops to Mt Kaukau. Despite the sun, it was windy and muddy but not hair-raising – which is good as my hair needs no help in that respect. There were a few people out walking their dogs, and one mad couple out running theirs, poor creatures. (Running is even less fun than going uphill, I can never understand why people do it. Are they masochists?) 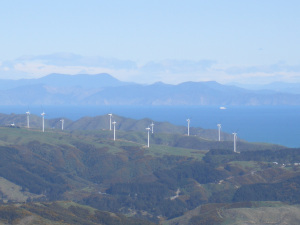 There were stunning views at the top, though – down one side was the city, and down the other a windmill-strewn vista looking out over Cook Strait to the South Island. From here, I left the NW to trot along the Skyline Track, wandering along the ridges, as while Wellington’s Te Araroa section goes mostly along the NW, it diverges in places and this is one of them. I was glad to spend some extra time up there as I was thoroughly enjoying myself. Most of that enjoyment, it must be said, was due to the kn0wledge that I was walking in the easy direction and it was all down hill from here, down Bell’s track and through the suburb of Ngaio to the local railway station, where I stopped last time I was on the NW. While it’s true that walking up hill and walking down hill both have their own special horrors, down is better than up any day in my book, and looking up at the tower from halfway down Bell’s track, I was smugly glad that I didn’t have to slog all the way up to it.